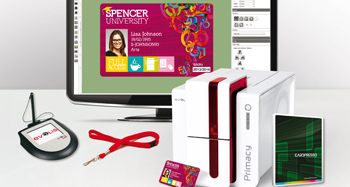 It is easy to create and personalise the cards with the cardPresso software. It offers users dozens of card templates, as well as various encoding options. Barcodes, graphics, photos or texts are quickly placed and easily formatted. Special database fields provide for easy, uncomplicated integration of dynamic database content. With Evolis you receive a complete set of products for the printing and reprocessing of plastic cards. From a small desk printer all the way to an automat for large industrial series, you will find the suitable machine for every task. It goes without saying that we also deliver optimally harmonised consumables, like colour ribbons, blank cards, chip cards or RFID encoders.